Markings: Ro. print (l.l.) blind stamp No.2a. Other Markings: None. "These people, whose way of life I had known from my youth, appealed to me because of their closeness to nature," wrote August Sander of the farmers who were among his first subjects. These images belong to his photographic documentation of the German people, which he eventually called "People of the Twentieth Century." Perhaps most striking about this portrait of three farmers walking along a country road on their way to a dance is their formal dress: each wears a hat and suit and carries a walking stick. This formal appearance removes them from the reality of their occupations. Each man is seen from the side, glancing over his shoulder at the photographer; they stop only for a moment before continuing on their journey. 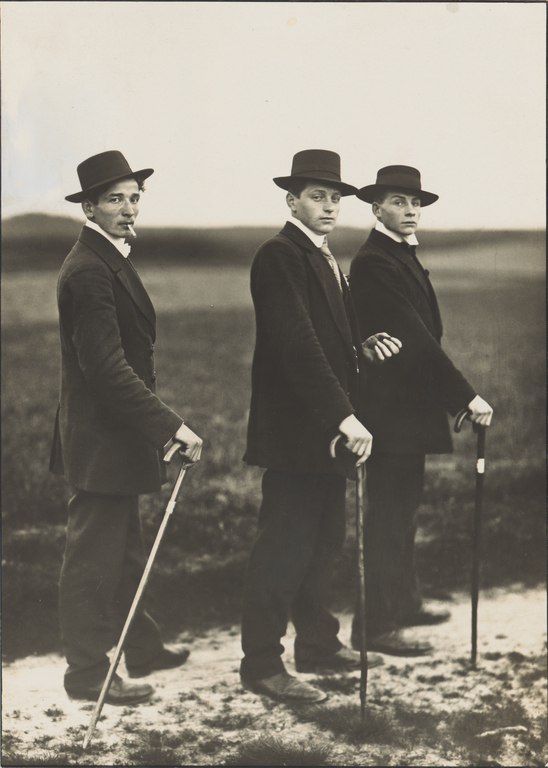 Naef, Weston J. August Sander: Faces of the German People, exh. brochure (Los Angeles: J. Paul Getty Museum, 1991), cover. Masterpieces of the J. Paul Getty Museum: Photographs (Los Angeles: J. Paul Getty Museum, 1999), p. 97. Naef, Weston, ed. In Focus: August Sander; Photographs from the J. Paul Getty Museum (Los Angeles : J. Paul Getty Museum, 2000). Sander, August. Menschen des 20. Jahrhunderts : ein Kulturwerk in Lichtbildern eingeteilt in sieben Gruppen = People of the 20th century : a cultural work of photographs divided into seven groups = Hommes du XXe sie`cle : une œuvre culturelle divise´e en sept groupes Vol 1 Der Bauer/ The Farmer/ Le paysan/ August Sander ; herausgegeben von Die Photographische Sammlung/SK Stiftung Kultur ; bearbeitet und neu zusammengestellt von Susanne Lange, Gabriele Conrath-Scholl, Gerd Sander. (New York: Distributed by H. N. Abrams, 2002).